Call us today for a fast and free estimate, upfront pricing, affordable rates, and reliable local and long distance moving services in Central New York. Syracuse Moving Company delivers dependable and affordable moving services to and from the Central New York region. We offer local, long-distance, residential, and commercial moving solutions. Whether you’re moving from an apartment, 4-bedroom home, or corporate office space, we can assist you today with licensed, insured, and trusted moving services. Our movers are intensely trained and experienced in safe packing, loading and delivery of furniture, appliances, pianos, beds, computer equipment and hardware, televisions, and all household and office items. Call us today at (315) 860-0772 for a free instant moving estimate. We provide upfront pricing, low-cost rates, and a detailed plan for your entire move. We look forward to helping you! We offer a full-range of moving services – packing, loading, delivery, and more. While most of our moving jobs involve houses and apartments, we’re also experts in commercial and office space moving for our local businesses. We’re local movers, but we’re always ready to go long-distance throughout the northeast, southeast, and beyond. You’ll never have to call another moving company again. The big franchise movers will charge you an arm and a leg, and maybe an ear. We can do the same work for a fraction of the cost. 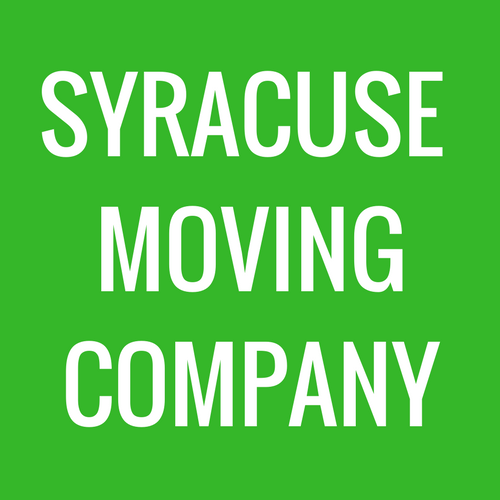 We offer some of the most affordable moving rates in the Syracuse, NY area. Keep money in your wallet. Tell us when YOU want to move and we’ll do our very best to accommodate your needs. We also work efficiently to finish your move in a reasonable time and save you money. We know you are busy and your days are hectic during a move. We’ll bring you a smooth move. We know that this is sort of expected of movers, but it doesn’t always happen that way. We take every precaution, however, to protect your belongings and deliver them in one piece. That includes careful packing methods, strategic loading, safe driving, and detailed delivery. We’ll return all your calls and emails and always keep you in the loop. We like to work with our customers to develop custom plans for their move. We’ll communicate with you regularly leading up to moving day and throughout the move. We don’t like to brag, but we’re proud of what we do. We like to say we’re the best moving company in Syracuse, but our work and customer satisfaction speaks for itself. Other moving companies in Syracuse and Central NY might have decent enough reviews on Google, Yelp, Manta, or Angie’s List, but none equal the true value of Syracuse Moving Company. Need help with your entire move – from start to finish? Our movers in Syracuse are always up for the challenge. The bigger the move, the better. Full-service moving is a specialty of ours, and a popular choice for our busy customers who have many other responsibilities to tend to during a move. Relax. We have your move covered. You won’t have to lift a finger or strain your back, arms and legs trying to move on your own. Best of all, we’ll make sure your possessions are moved carefully and delivered in the same condition that you left them with us. Whether you’re moving locally in Syracuse or upstate NY or long-distance, choose our complete A-Z moving services. Don’t need full-service moving? No problem. We can help you out when you need us most. Plus, only taking care of specific parts of your move will save you money. We use packing paper, padding and more to make sure your most treasured possessions are packed safely and won’t break in transit or while loading or unloading. We also can unpack your items and place them where you desire in your new dwelling. We can load and unload all or some of your items. We have our own reliable moving trucks, but we’re happy to load your U-Haul, Budge, or Penske rental truck , PODS container, or any other vehicle for transport. We strategically load boxes and items in moving trucks so they don’t move, tip, or break while on the road. We move your items where you want them in your new home, apartment or office. We can place your home appliances, couch, bed, pool table, safe, piano, television set, and more. Just tell us where, and we’ll deliver. Don’t worry about it. We have all the supplies necessary to make your move go as smoothly as possible. We always have moving boxes, tape, packing paper, padding and more in stock. We also have rubber-wheeled dollies, rope, and bungee cords for safe moving. Long distance moves in the U.S.
Why you might need our help? Why turn to a professional moving company for assistance? Moving on your own can be a major hassle. It can be frustrating, exhausting, and painful. Yes painful. 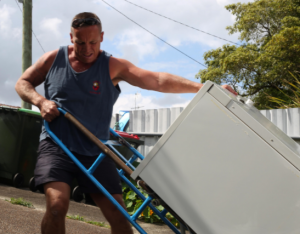 Have you ever tried lifting your fridge on your own? It’s heavy. You’re way too lazy to do it on your own. You’d rather play golf, go to the beach, or do something you enjoy. You’re way too old to be lifting things heavier than 50 pounds. Your back, arms, legs, hips or neck ache. You have young children who need constant attention. You don’t want to guilt friends and family into helping. You don’t have a six-pack of strong men at your disposable. You just don’t feel like it. We provide local and long-distance moving assistance to and from Syracuse, Cicero, Clay, Baldwinsville, Liverpool, Jamesville, Fayetteville, Manlius, North Syracuse, East Syracuse, DeWitt, Marcellus, Camillus, Skaneateles, Onondaga, Auburn, Ithaca, Oswego, Rome, Cortland, Fulton, Utica, and other towns and communities throughout the Central New York Region. Call us today at 315-860-0772 for a free and accurate moving quote, and expert service that is affordable. Quality and affordable moving company serving Syracuse and Central New York. Call (315) 860-0772 for a fast and free estimate. Quality and affordable moving company and services in Syracuse and Central New York. Call (315) 860-0772 for a fast and free estimate.